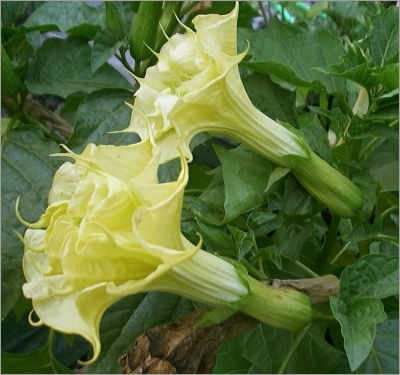 Datura yellow double, the Horn of plenty, is a member of the Soanaceae, or nightshade family and origins of Central America. The plant is quite compact in containers, reaching only about 1 to 2 feet high. In the garden, it forms a dense, well-branched shrub to 3 feet tall and slightly wider. Normally treated as an annual, the plant can be over-wintered in a greenhouse environment. Fully double yellow flowers measure 6 to 8 inches across. This eye-popping Angel's Trumpet looks like something from a hot-house instead of an easy-to-grow, sun-loving tropical you can start from seed. Beginning in early Summer and continuing until the Fall weather sets in, the plant is covered with magnificent blooms, so fragrant that a single plant perfumes the garden. Datura yellow double looks upward, the immense 6 to 8 inch flowers exquisitely whorled and twisted to show off their beauty. Green leaves complement the flowers. The stems and buds have a black currant stain. The flowers are followed by highly ornamental fruits, remaining decorative for long periods. All parts of plant are poisonous if ingested.